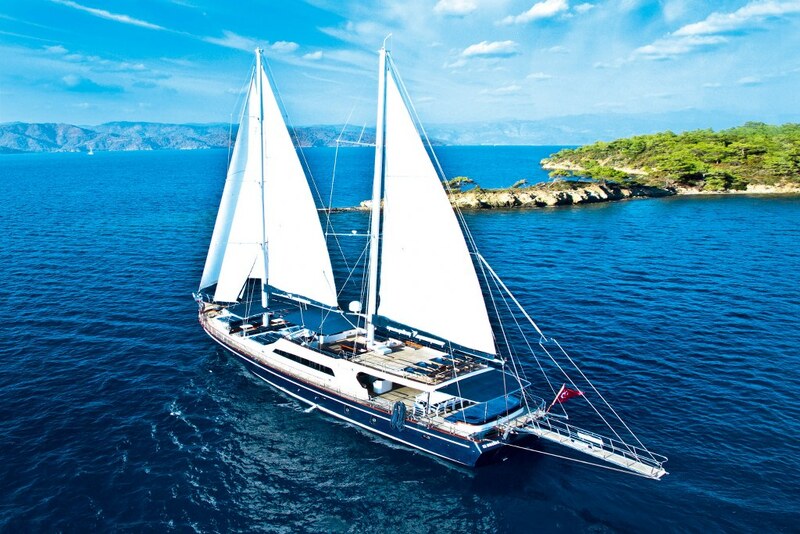 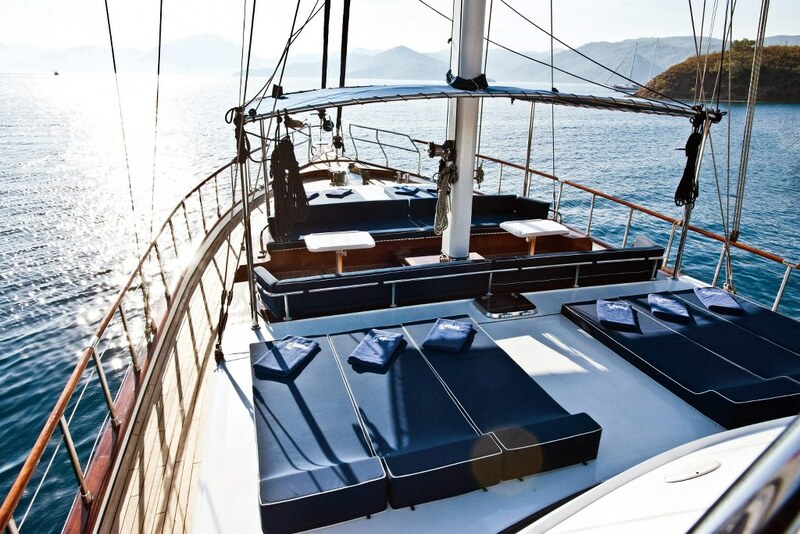 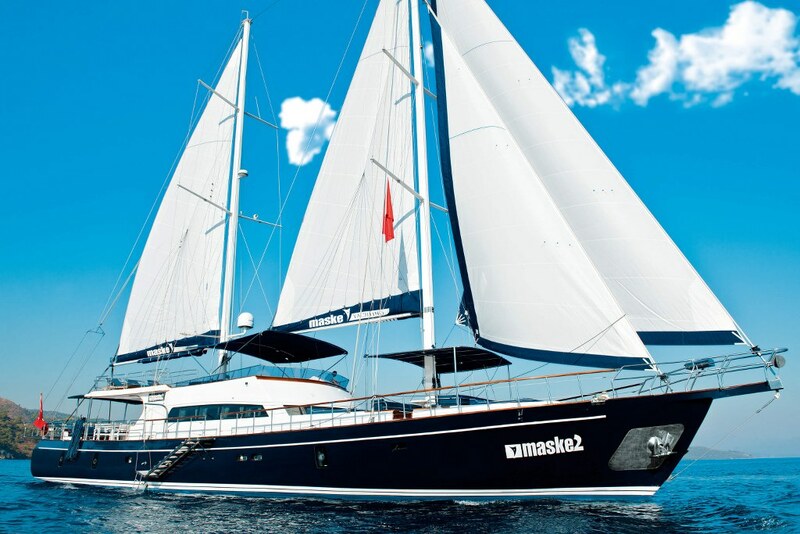 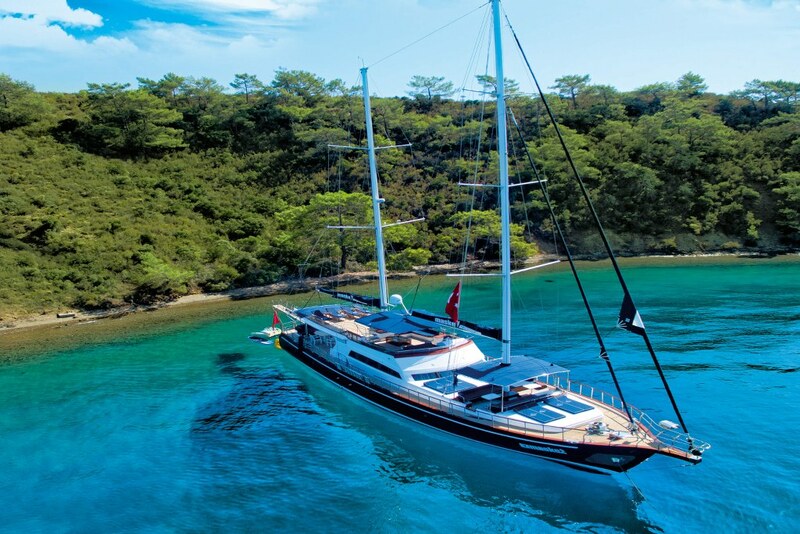 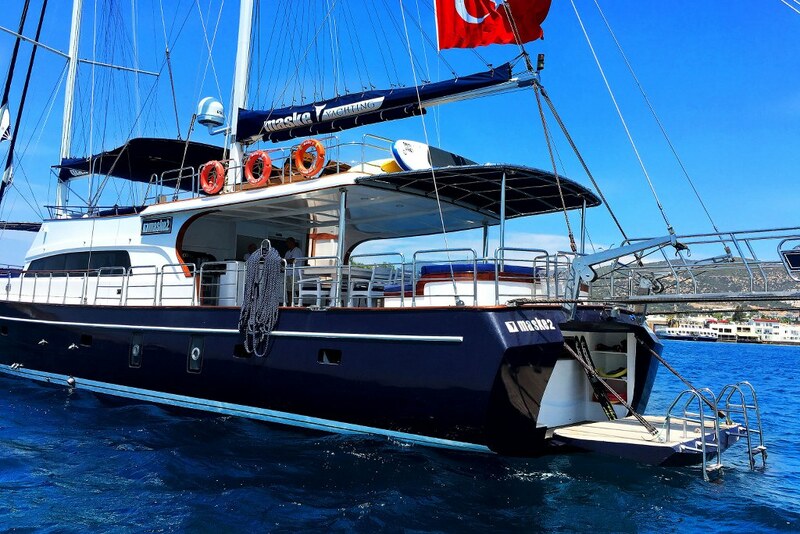 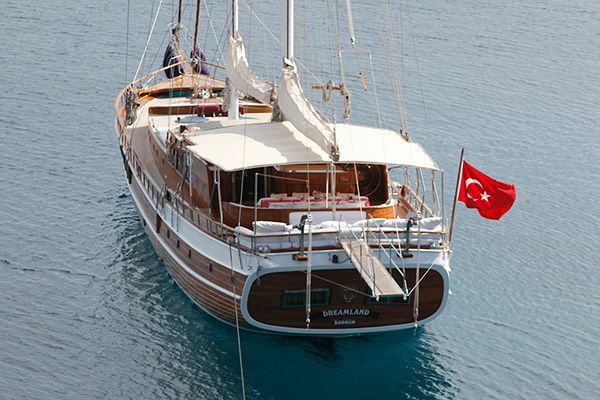 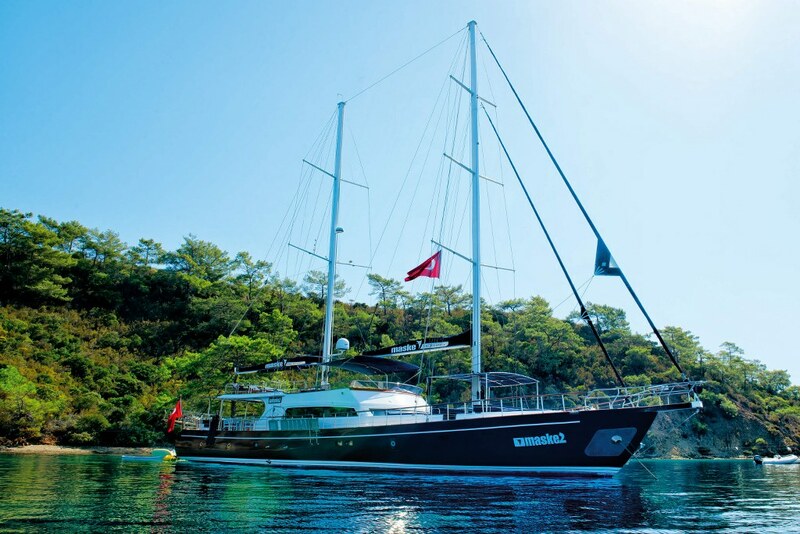 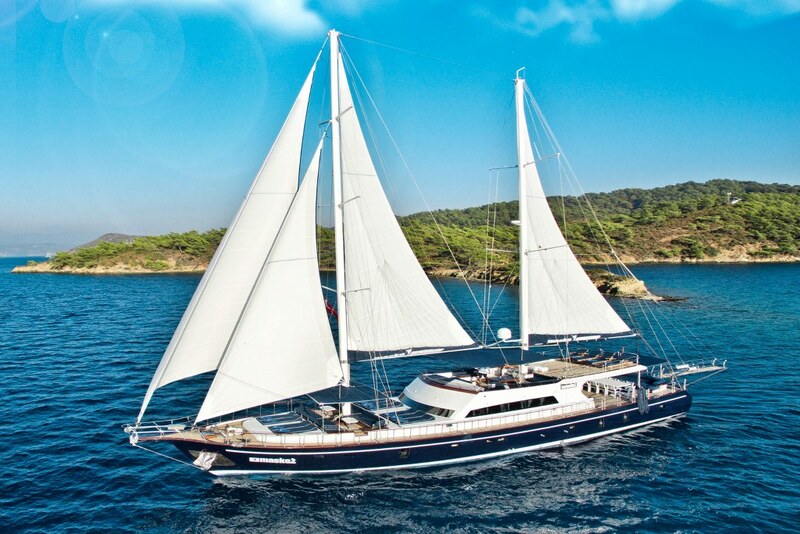 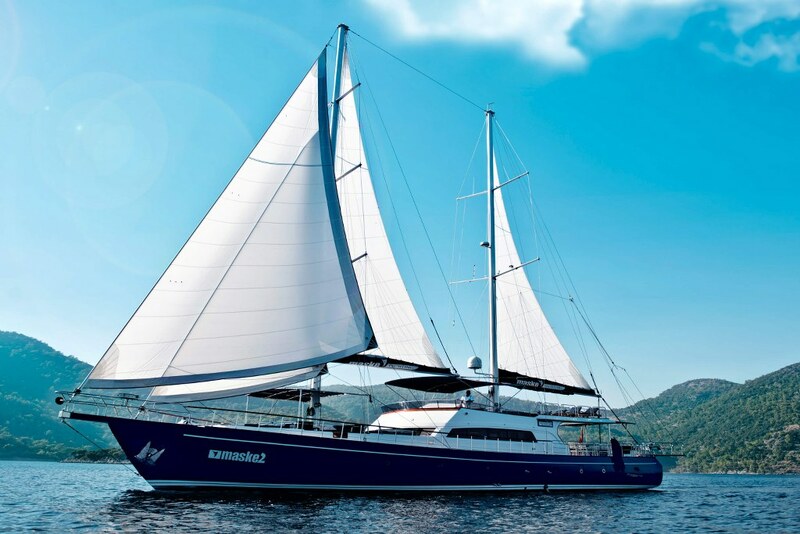 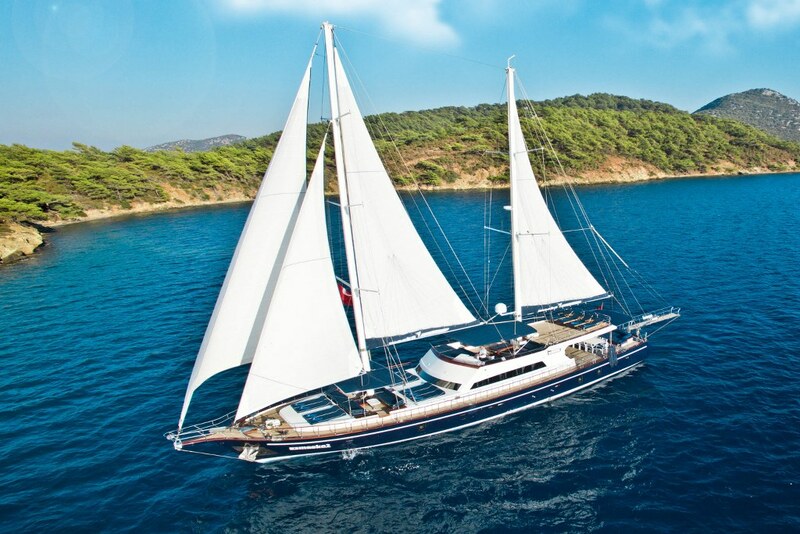 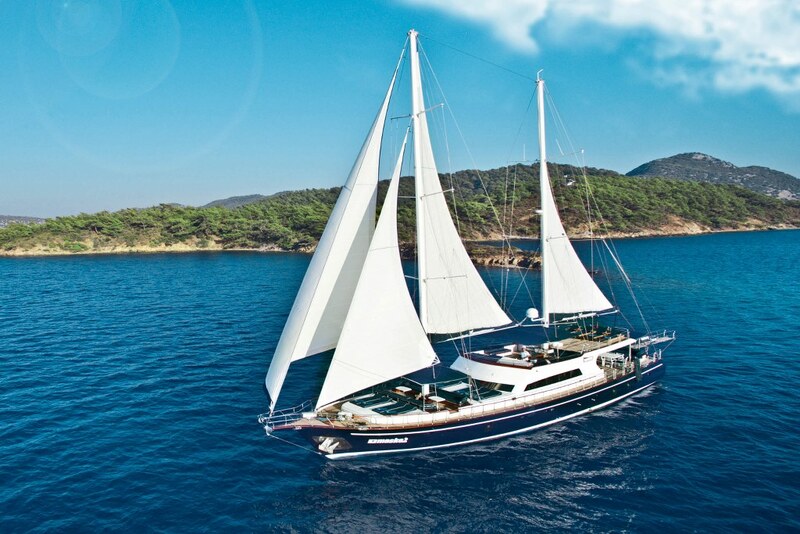 Gulet Maske 2 is a delightful Luxury ketch with all the comforts of a crewed motor sailing gulet. 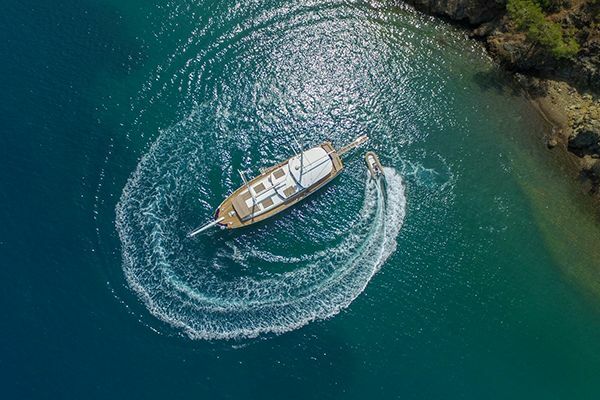 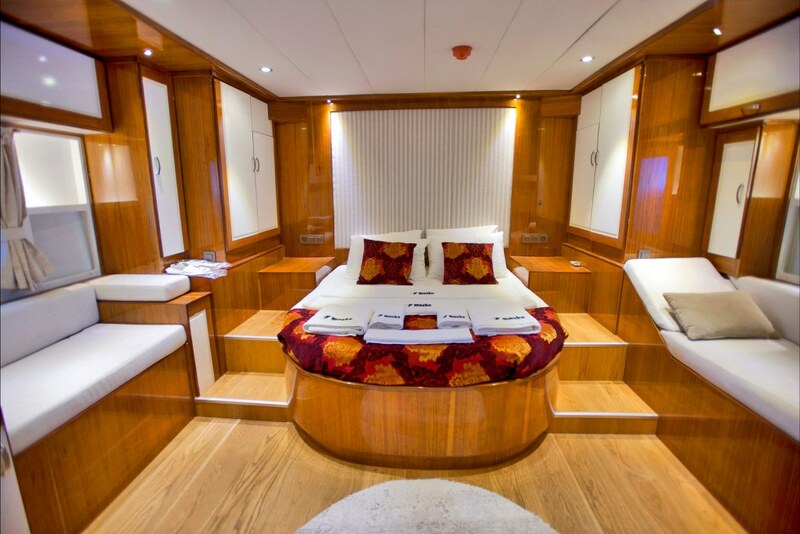 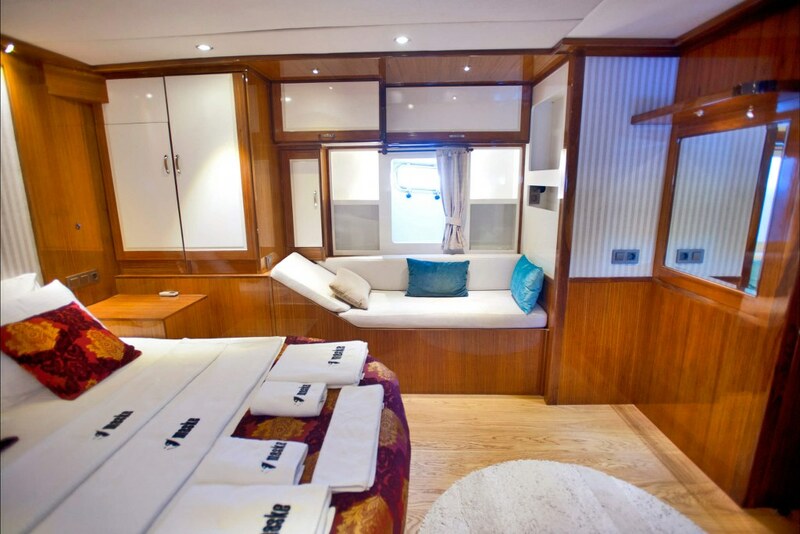 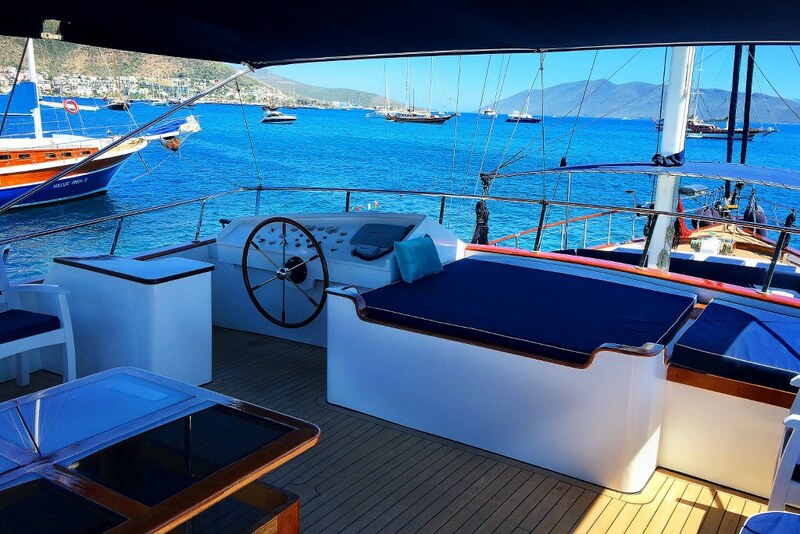 Extensively renovated and decorated with particular care, she offers contemporary style well-furnished cabins, and a generous variety of outdoor deck space including the extra seating and sunbeds area up on the fly bridge, which was added in the extensive refit of the yacht in 2013. 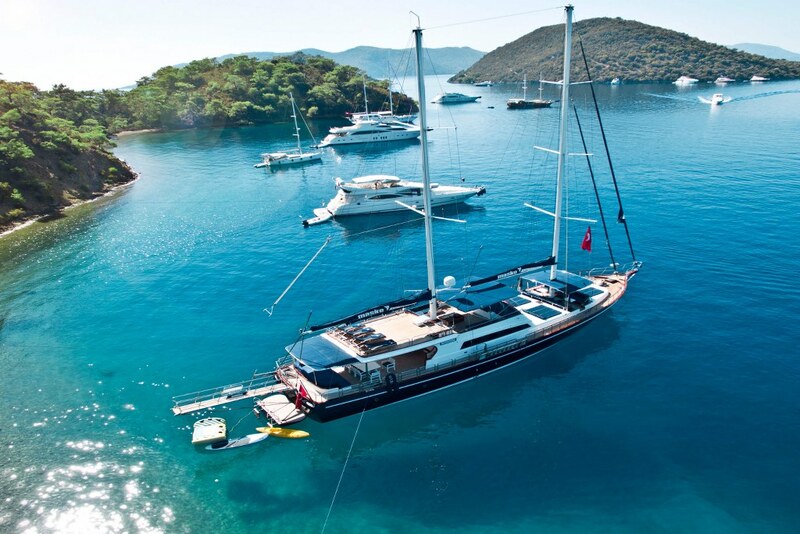 The flybridge is a superb spot to enjoy the breeze and views by day or night. 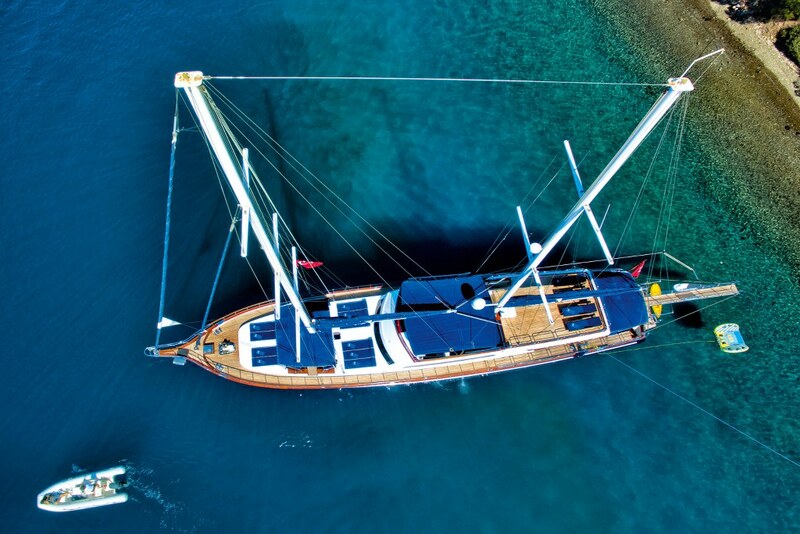 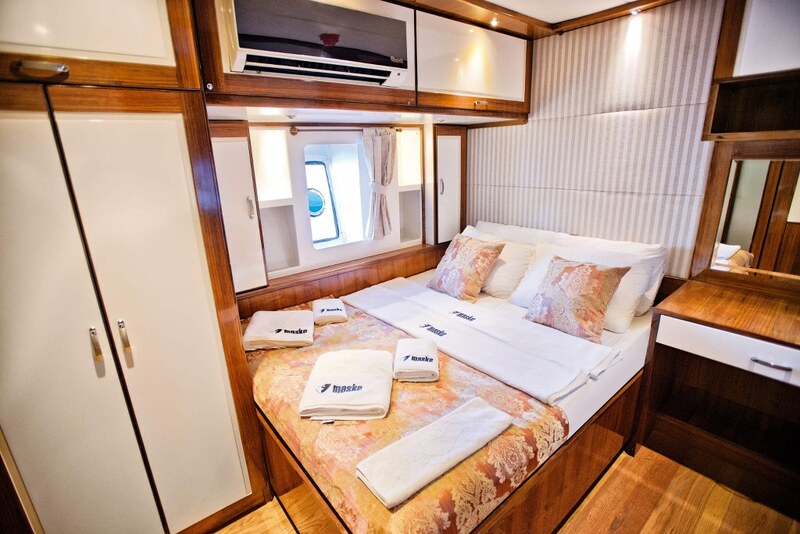 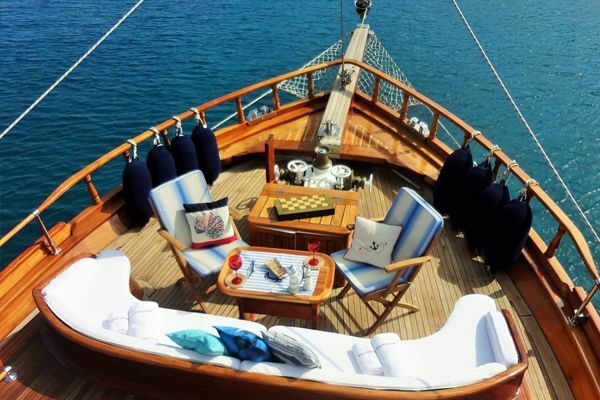 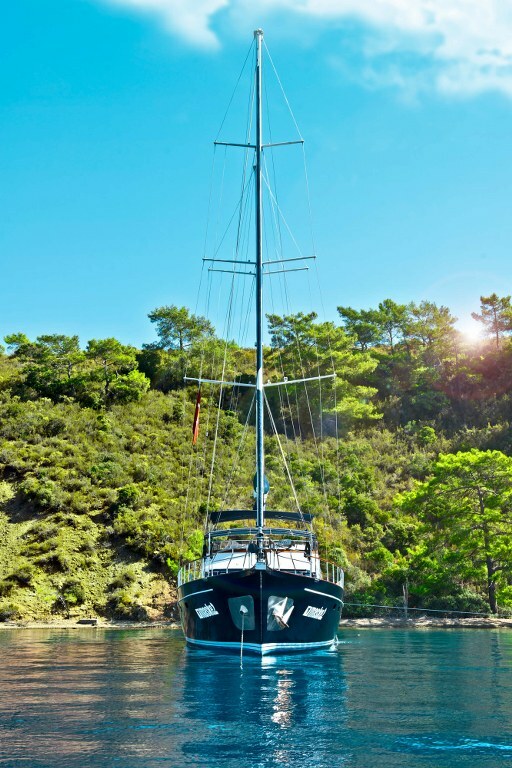 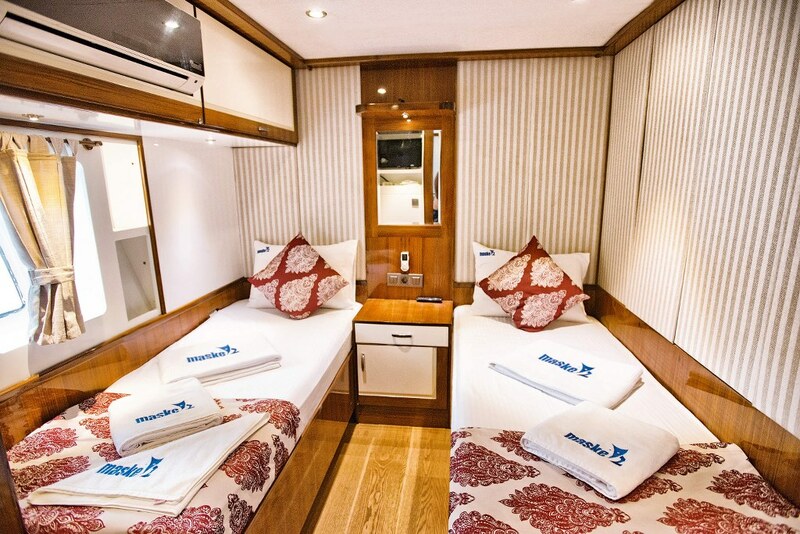 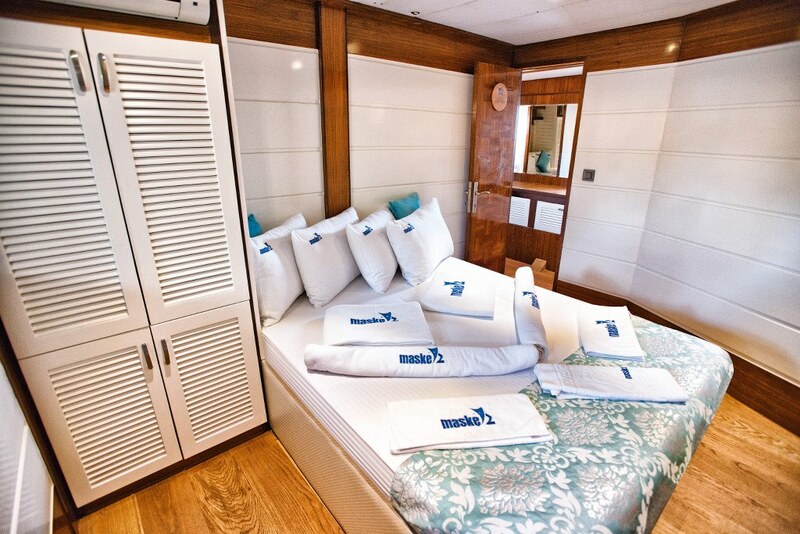 Turkish built gulet Maske II offers six comfortable air-conditioned cabins include two spacious master cabins fore and aft, three double bed cabins, and one twin bed cabin, where the layout offers a great deal of flexibility in accommodating families or a group. 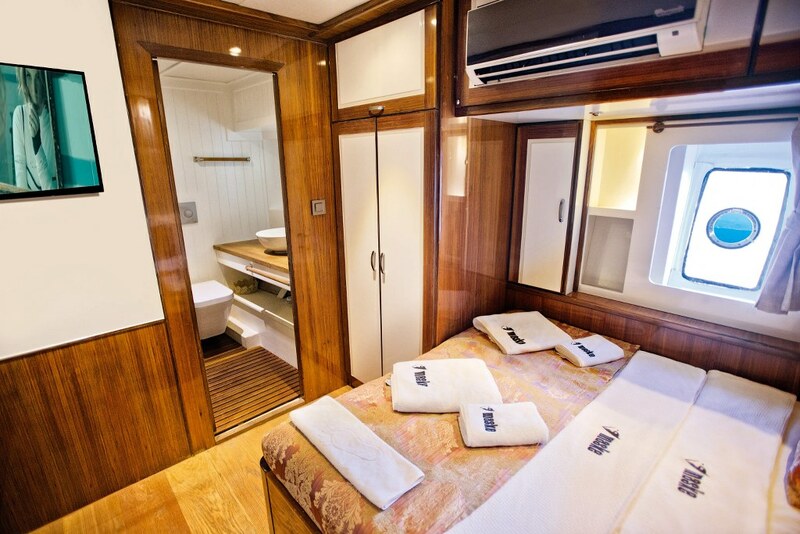 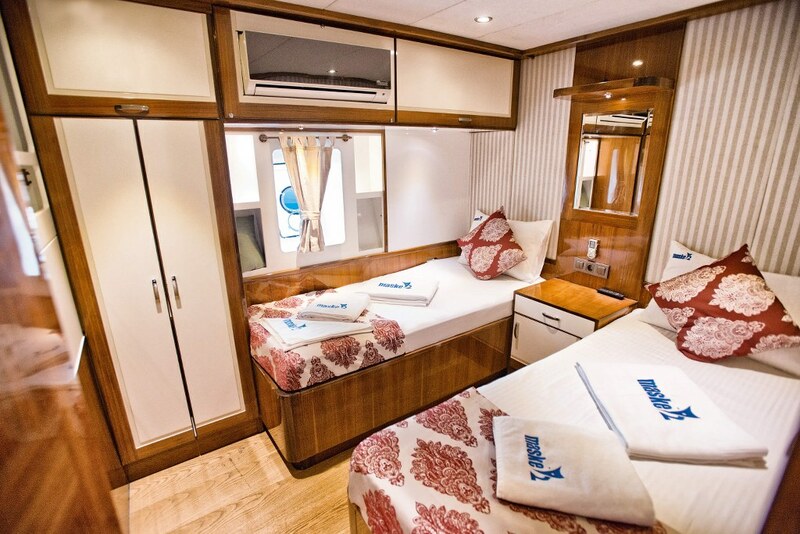 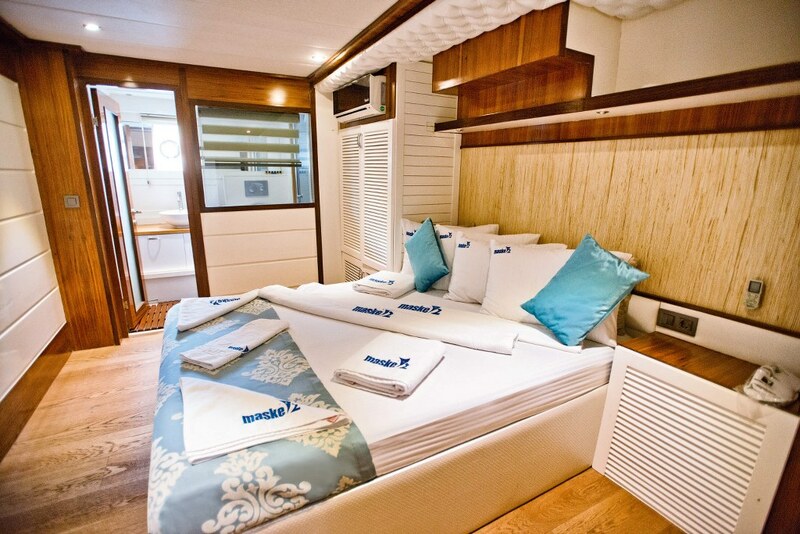 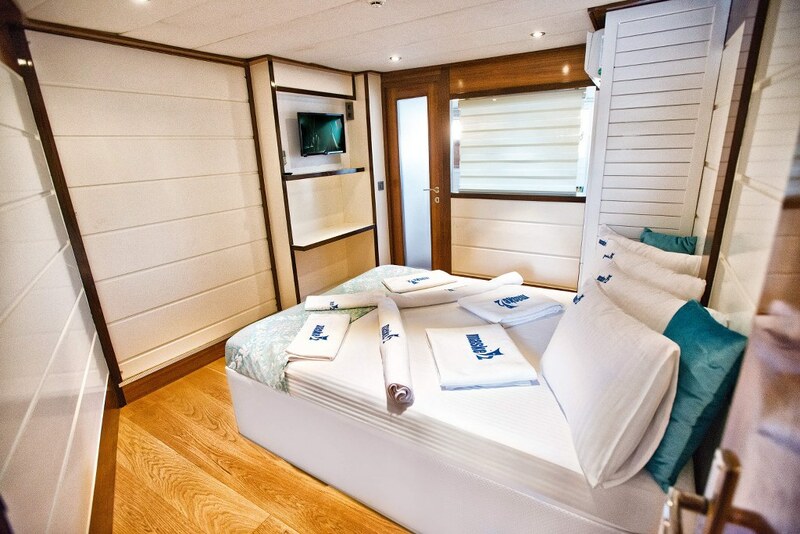 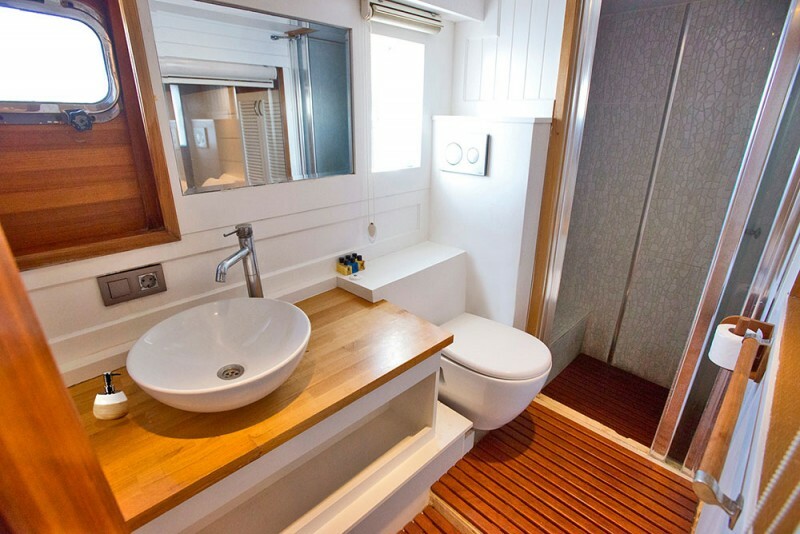 All cabins are well decorated, have good storage space, and have well- appointed en suite bathrooms. 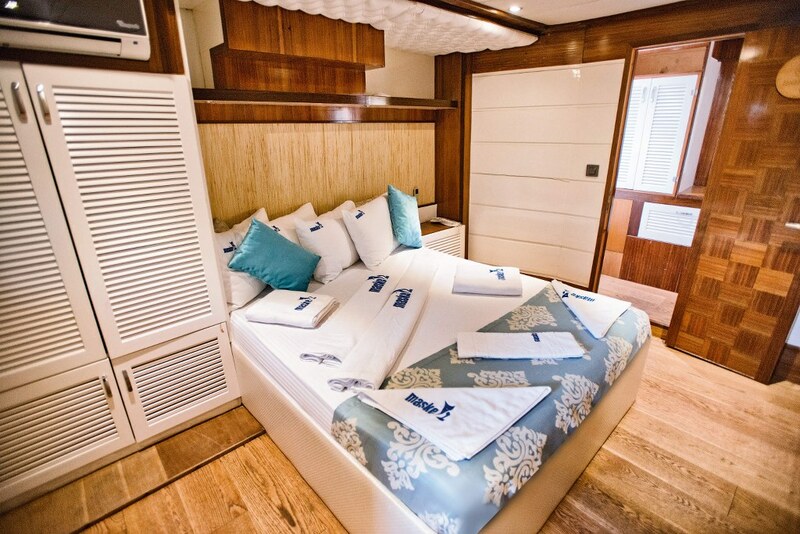 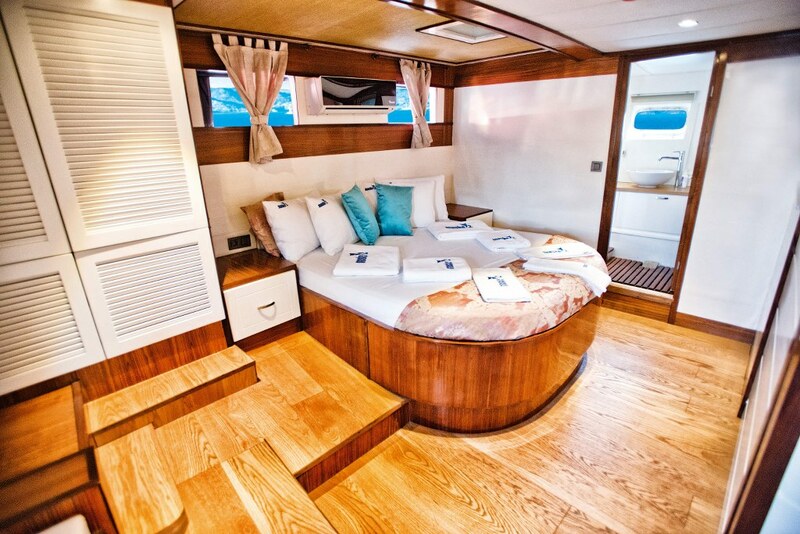 The indoor saloon on yacht Maske II is air-conditioned and furnished as a lounge area for relaxation with the TV/DVD and music system. 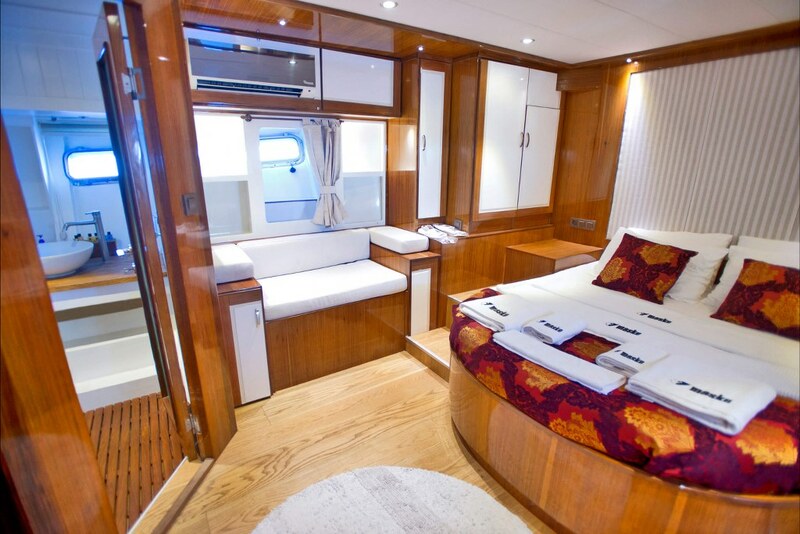 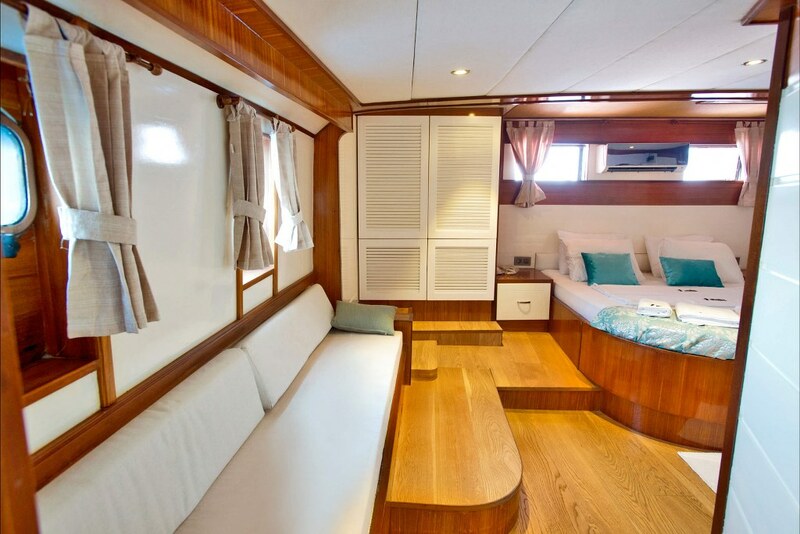 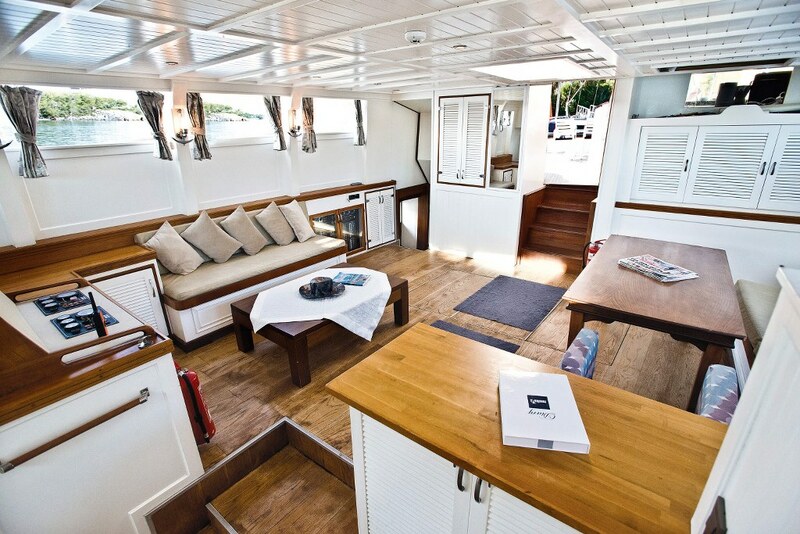 On the wide aft deck the large dining table and chairs and the sternside bank of cushions offer more space for relaxation under the shade and another TV screen and music system, and guests are well catered for with the corner bar and coffee machine. 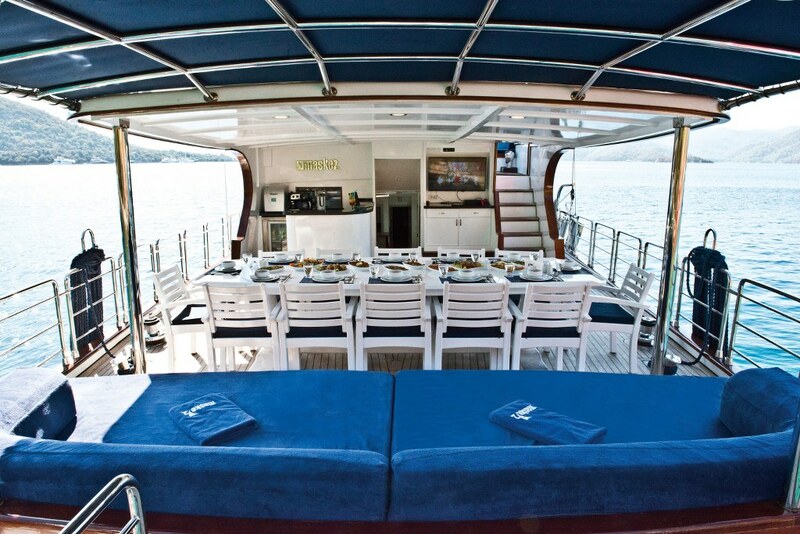 The fore deck has the most inviting group of forward and aft facing cushioned seats, shaded if needed, creating another delightful area for relaxing, gathering for conversations and cocktails or simply lazing. 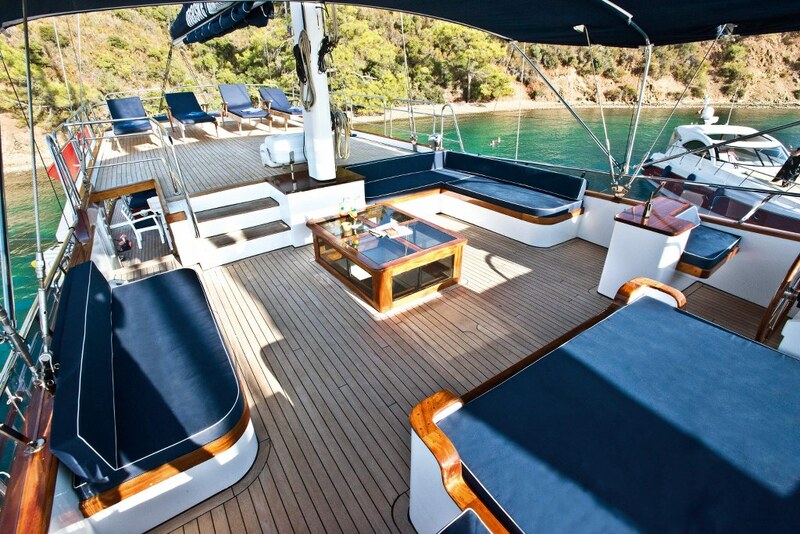 Sunbeds are arranged each side of the conversation pit. 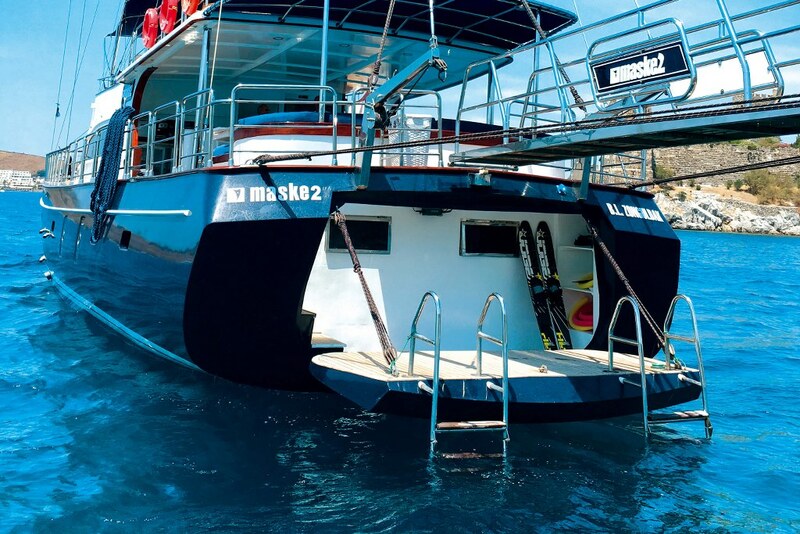 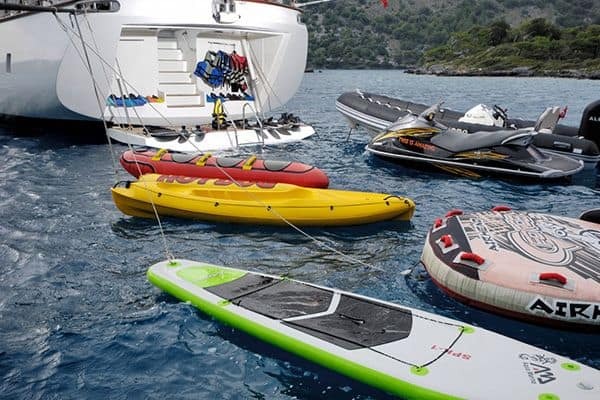 The Maske 2 boat has a motor yacht feature with the drop down swim platform set into the stern, allowing for easy and comfortable access to the water and for the use of water toys. 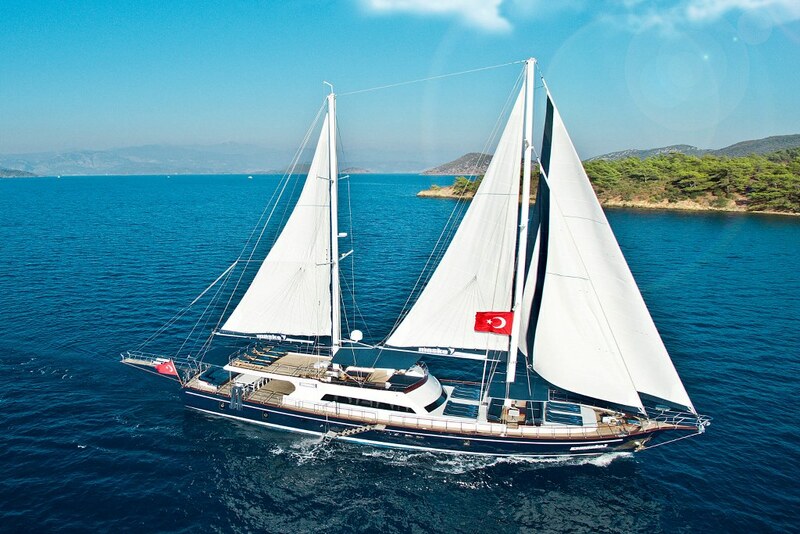 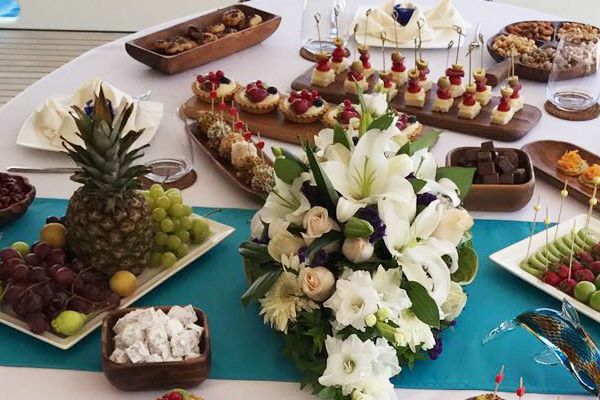 The professional captain, cook and crew create and serve excellent meals, see to the management and navigation of the Maske 2 gulet, and do their very best to see that all guests aboard enjoy an excellent gulet cruise holiday along the Mediterranean and Aegean coasts of Turkey and the nearby Greek Islands of the Dodecanese.